The objective of this weeks video is to just add a little bit of rotation and a little bit of leverage from the ground. We're going to start to use our legs a little bit more to help ramp that speed up and hopefully we will get some good progress like we've been seeing around the site. So if you're ready to add some more speed to it, let's go and get started. Okay, guys. So last week we worked on adding a little bit of weight shift to our release to help create a little bit more momentum and we allowed you guys to get away with a little bit more movement from your head position and the reason being is is that if we focus on too many areas of the golf swing at one time becomes very difficult from a proprioception level wise to be able to accomplish what the main task were. And really what we're trying to do is, our focus point was going to be on the lead wrist and hitting area and making sure that we were transferring our weight. That's a really big crux of the golf swing is that amateur golfers don't tend to like to shift their weight enough. So now this week our objective is is to add a little bit of rotation to the mix and get some good force from the ground. And I know a lot of you golfers have seen Bubba Watson and are some of these other players like Matt Every where they come way up on their toes when they're swinging their drivers and the reason for that is that they're using their legs to push down into the ground, so in turn what they're doing is their body is going up and the club is going down. That's helping extend the radius. Now we're not going to be doing it of that magnitude in today's golf swing drill. We're still trying to keep things under control and we're just going to be adding a little bit of rotation to it as well. Okay, guys. So in step one of this new drill that we're going to be adding a little bit of rotation and a little bit of ground force, we're going to start without a golf club this week. So, we're going to aim for probably anywhere between 50 and a 100 reps done without the golf club so that you can make sure that these movements are perfect first, because now you got to think of it this way. We had very few moving parts at first. We had just the left wrist moving in the very first video. In the second video, we added a little bit of weight shift to add. Now, we're going to have those two components mixed with a little more of a body movement here and a little bit more of a focus point with what your lead hip is going to be doing down the impact area. What this drill is going to look like for now ... We're going to put the club in our hands here in just a minute. Go ahead and get into your normal setup here, normal golf posture. Two inches outside of neutral joint alignment. Cross your arms over your shoulders, and what we're going to do is we're going to make just a one inch shift of our hips to the right. Just about a one inch shift to where you feel about let's call it 70 to 80% of your weight right into that right heel. Right into your right heel, right ankle area. Then what I want you to do is I want you to keep your right knee flexed and facing forward. So we make that small shift and then you're going to just turn your body to about 45 degrees. So 45 degrees of rotation here, maintaining the flex in the knees. What I don't want you to do is I don't want this right leg to go straight, because you won't feel contraction in your glute muscles back here. If you maintain that flex, what it's going to do is it's going to inhibit, it's going to restrict the amount of rotation that you have and it's going to help you load your glute muscles up. So again from the line, small shift, and you can see that my shoulders have rotated about 45 degrees or so, my hips have only wound up about maybe five to ten degrees. So you're going to start with that first, loading up your trail side, and then what we're going to be doing here is we're going to do our best to make sure that when we sit back over into our lead side, we're going to try to keep our back to the target. So you can see that my shoulders did unwind, but what happened there was because I was focused on moving my weight into my left heel, you can see that my hips are starting to pull my shoulders. So from a face-on perspective, load up, I'm going to shift my weight into my heel, and now you can see that my hips and knees are back to a square position, my shoulders are still pretty closed. Now as I start to push the heel into the ground, you can see that my shoulders have been pulled back to square and I'm back in that impact position that we started to talk about in the beginning part of the week. What you're going to be looking for at this position, again just to refresh you, is that 80% of your weight is on your lead foot, 20% or so is on your trail foot, head's behind the golf ball, so that's going to have enough tilt to where your spine's just outside your lead knee, hips are open about 30 to 40 degrees at this point now because we're using ground force and the more you push into the ground the more your hips are going to start to unwind. Okay, so 30 to 40 degrees and shoulder line should be nice and square. So let me demonstrate that for you again. Small shift right, right knee flexed, try to hold your back to the target or your shoulders wound, shift left or sit into that left side, clear the hips, arms down in front of you. Do that 50 to a 100 reps and then we're going to slowly add the club back to the mix. So let's look at part two now. Okay, gang. So here we are at part two and our objective for these next 900 reps, because we just did 50 to a 100 reps of our body movements alone, is to still focus on making sure that the other two parts are still in line. Okay, we're just going to do a little bit of cleaning up of the overall head movement and we're going to get us onto a really good sound impact position and we're just going to add a couple of other moving pieces here. Now, the one big thing I want you to understand is that if you feel like you're starting to see some breakdown in your lead wrist or you feel like you're having a hard time with weight shift, don't be afraid to pump the breaks here, pull yourself back, do several reps of those other drills and then slowly add in these other pieces. Sometimes it feels like we're kind of rubbing our belly and patting our head at the same time and I don't want to add too many pieces in here that are going to confuse you. That was the whole point of not using the club at first for this part of the drill because, again, we're now adding rotation and we're adding a big move from the legs at the bottom half of the swing. Now, let's get into the drill here. We've just spent our time working on our body movements. We're going to focus on making that small shift to the right, keep your right knee flexed and you're going to turn your body to about 45 degrees. So a couple of little check points I want you to focus on here is, number one, both arms should be fairly straight and relaxed. Don't get your right arm really bent, but also notice that I have a little bit of wrist set here. I don't have the club perfectly parallel to the ground. Got a little bit more set. For those of you that want to add a little bit more of elevation to get your hands at about chest height, that's perfectly fine, but what I want you to focus on now from this point is, we're going to sit and we're going to try to keep our arms and shoulders where they are into our left heel. Now you can see my head move back to its original position, my hips and knees have come back to a square position. Remember, my hips were wound up at about 5-10 degrees or so and then they come back to a square position. So that movement alone is starting to pull the shoulders and the arms. So here I am at that wide spot, okay, I'm going to sit left, keep my heads quiet now, push the heel in the ground and then I'm going to release. And when I tell you to push the heel in the ground, I really want you to be able to feel like you're driving that heel into the ground as hard as you can. I don't want you snapping your knee straight. I want you just to feel like you're pushing it into the ground. Now, if you notice here from a down the line perspective, if I just push my heel into the ground and I got enough weight over there, you're going to see the hips start to rotate. If you have enough awareness of your mid-section, where you can feel your obliques, then you can use your lead side obliques to help move or rotate the hip back towards center. So that would be towards your spine. You want to feel like you're pulling the hip away from the target, but you also want to make sure that you've got enough weight into that side because otherwise you run the risk of getting way back here, you can over-rotate the hips and then we have mess of issues on our hands. A lot of you know what it's like to be hip spinners. So again, drill's going to look like small baby shift right, rotate our body, sit in the left heel, keep the head quiet, and grab and release. This is going to help add a lot of speed to it. So I'm going to go ahead and get into what it looks like once you've done enough reps to where you don't feel like you have to pause. So I'm going to go ahead and try to tie it all together now. Let's look at that again. Small shift. There you go. You can see that I'm starting to add a lot more speed to it. You can hear the sound of it. This is a good drill now to start to get some more moving parts to it. Now when we get into the final step of this, you can really have a ton of speed in it and you still have all that control that we worked to get in the first place. All right, guys, let's get out there. Let's put it to use. Thousand reps is our goal this week. Let us know if you have any questions at all. We'll help you along the way. Let's make it a great day. Get Your Free Membership to Finish Watching "Perfect your golf impact - 3 of 4" Right Now! Join our 352,792 members to watch this video and 200+ more! 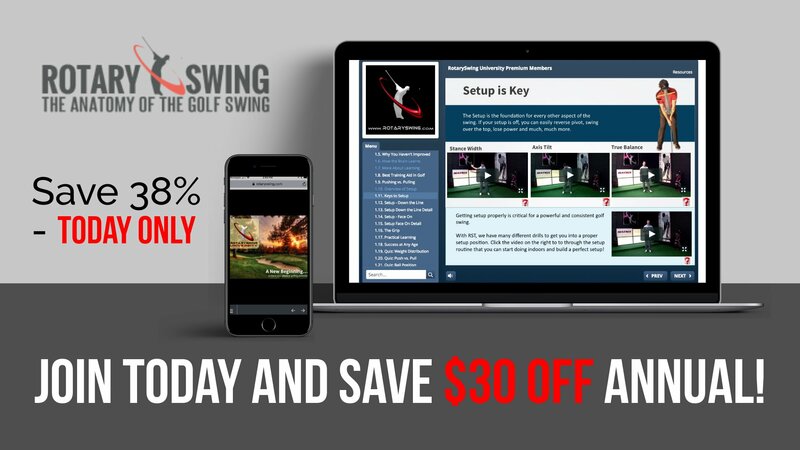 Join RotarySwing today with our lifetime guarantee and get immediate access to our 500+ other instructional videos!